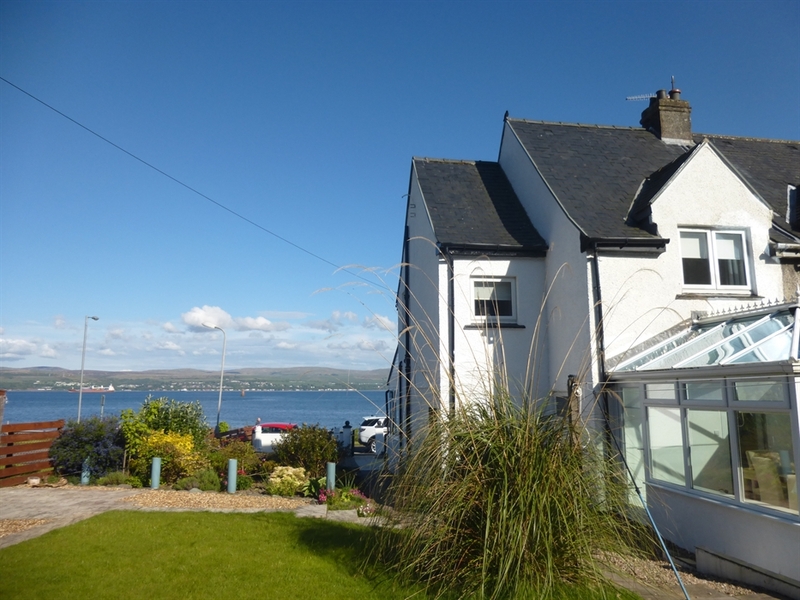 Admirals View is a Stunning Shore Front Coastal Holiday Home Boasting Magnificent Sea Views across the Clyde Estuary to the Ayrshire Hills and beyond that cab be enjoyed from the comfort of your arm chair. Newly Refurbished and Quality Furnished to a High Standard, ideally situated just a stones throw form the beach in the Scenic Village of Innellan, just a few miles from Dunoon. Enjoy the Peace and Tranquility of Admirals View, BBQ in the Gardens to the sound of the waves and the Sea Birds Song. Admirals View is a 2 Storey Building, Down Stairs comprises of a Entrance Porch with Seating to enjoy Breath Taking Sea Views, Quality Furnished Living Room with a 4 Piece Leather Suite with recliner chair, Pebble Effect Fire Surround, a 40'inch Flat Screen High Definition Smart TV, Blue Ray DVD Player, complemented with unlimited Free Wi Fi, Net flix, Catch up TV and other streaming channels are also available if you have your own personal account. Upstairs there is a Double Bedroom to the front of the building with the same Spectacular Sea Views, soft furnished tastefully in a Romantic Nautical Theme, the ideal spot to watch the Seals swimming in the Bay. The Back Bedroom over looks the Garden and has a flexible setting of a Super King Luxury Bed and One Single or the Super King can be split to create a room with 3 Singles to suit your requirements. Also soft furnished in a Bright & Fresh Nautical Theme. The Bathroom has an Electric Shower over Bath and each Guest is supplied with One Bath Towel and One hand Towel,Ceiling to Floor Double Patio Doors opening onto front garden with Spectacular Sea Views. A well very Equipped Kitchen with Electric Hob, Oven, Grill, Microwave, Washing Machine, Kettle and Toaster. A Wonderful Bright and Airy Consevatory/Dining Room overlooking and leading into the rear garden. The Garden has a delightful Patio/Seating Area with BBQ with Breath Taking Sea Views, Perfect to enjoy Alfresco Dining. Admirals View is Fully Double Glazed with Full Gas Central Heahing. Admirals View Sleeps a Maximum of 5 Plus One Infant up to the age of 18 Months. A Cot/Bedding/High Chair is available on request, Subject to Availability Please Advise When Comnfirming a Reservation? We are also Pet Friendly, 2 Well Behaved Pets are welcome, although we ask Please do not leave Pets unattended unless happy and secure in your Own Personal Pet Cage. Pet Fee £5:00 per Night or £20:00 per Week. Please advise when confirming your reservation.